OceanicTime: ORIS Carl Brashear CHRONO Ltd.
ORIS Carl Brashear CHRONO Ltd.
Here’s a proper look at the new Oris Carl BRASHEAR Chronograph Limited Edition and the story behind it. The is a celebration of a diving legend, Carl Brashear. 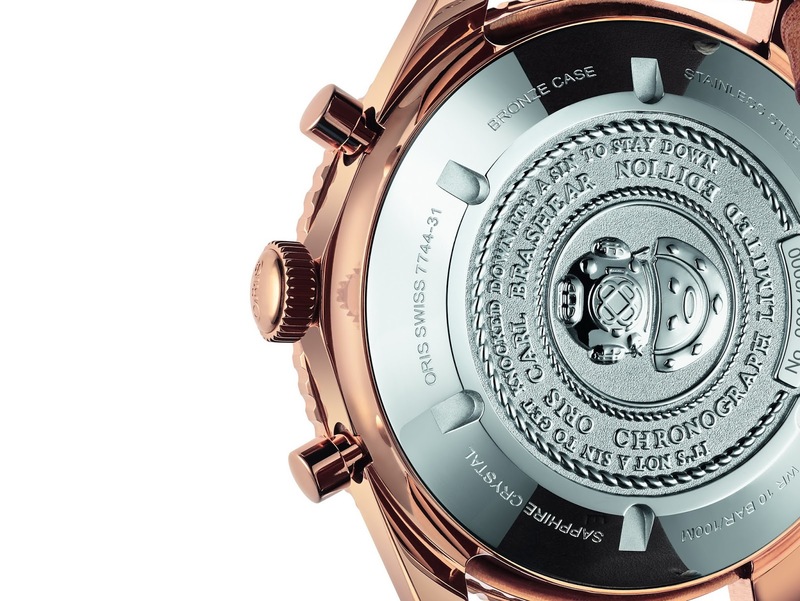 Perhaps you could say that the chrono-functions are reminiscent of how he was repeatedly stopped in life – but kept on going. 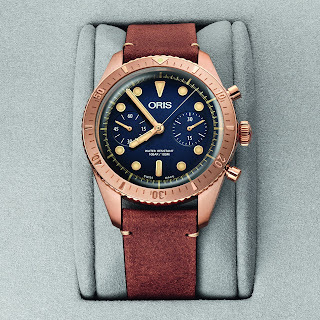 Carl joined the US Navy in 1948 as a 17-year-old and soon decided he wanted to become a deep-sea diver. He graduated from the Navy’s diving program in 1954, despite facing discrimination on account of his race. In 1966, he lost the lower part of his left leg in an accident during a mission to salvage an H Bomb. After an exhausting period of rehabilitation, he became the US Navy’s first amputee diver in 1968, and then qualified as a Master Diver in 1970, the first African American to do so. 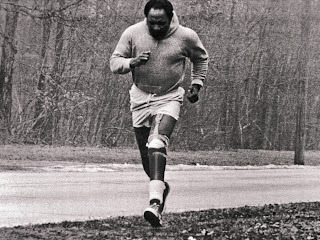 After a distinguished 30 year career in the US Navy, Carl Brashear retired in 1979. He died in 2006 aged 75. 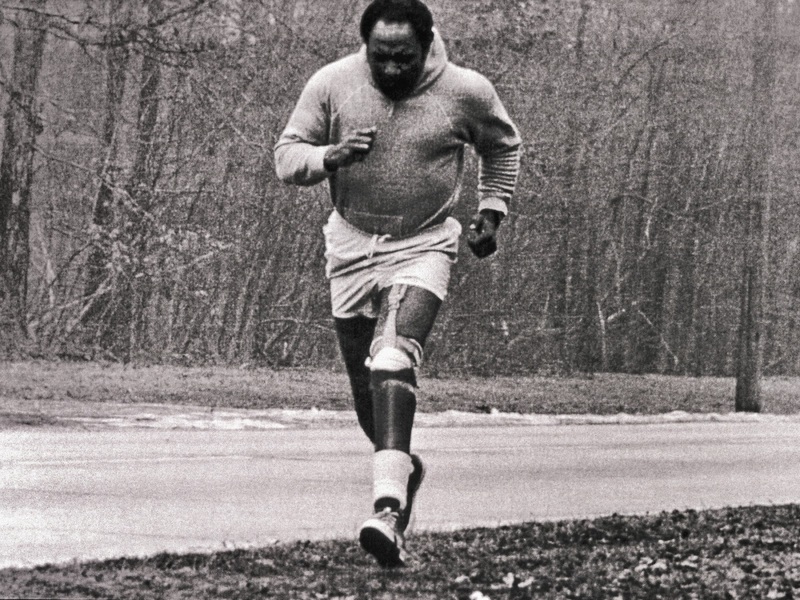 His extraordinary story was the inspiration for the 2000 film Men of Honor, in which he was portrayed by Oscar-winning actor Cuba Gooding Jr.
Down the bottom of the post is a picture of Carl training on his prosthetic leg back in the 70s. Footage from this scene was used in the documentary about his incredible story, Comeback. 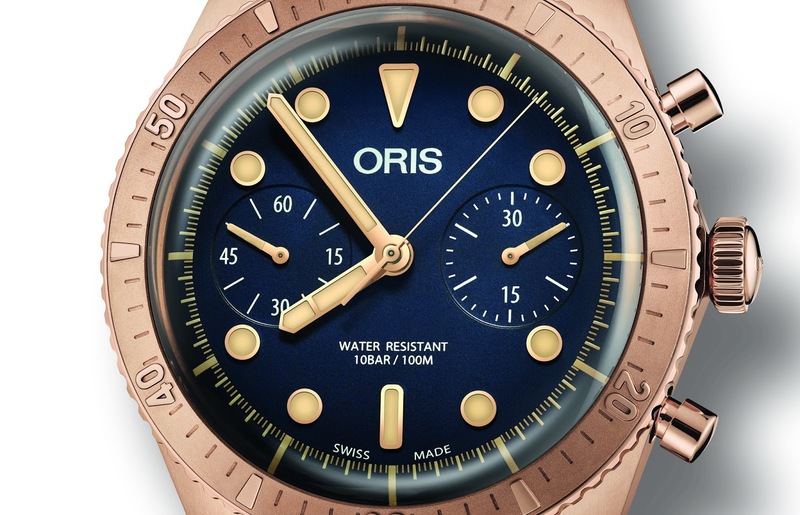 Powering this watch is an Oris Caliber 771, a special movement with a two-counter chronograph and 48-hours of power reserve. The Cal. 771 is based on Sellita’s SW 510. 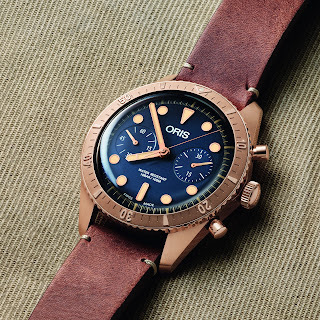 I believe this is the first time Oris have it used it over the 7750. 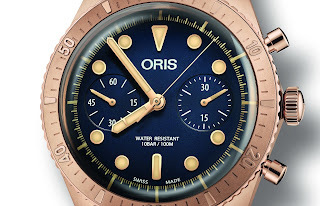 The curved dial is dark blue. It looks sensational, I must admit. Oris say of the dial that its balanced, symmetrical layout is known as ‘bicompax’ giving the watch a classic chronograph style, which is further accentuated by the absence of a date window. 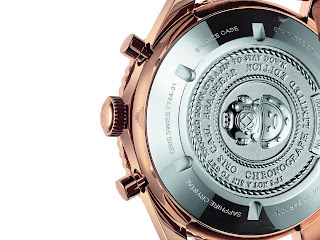 The sub-dial at 3 o’clock is a 30-minute counter; the sub-dial at 9 o’clock is a small seconds. 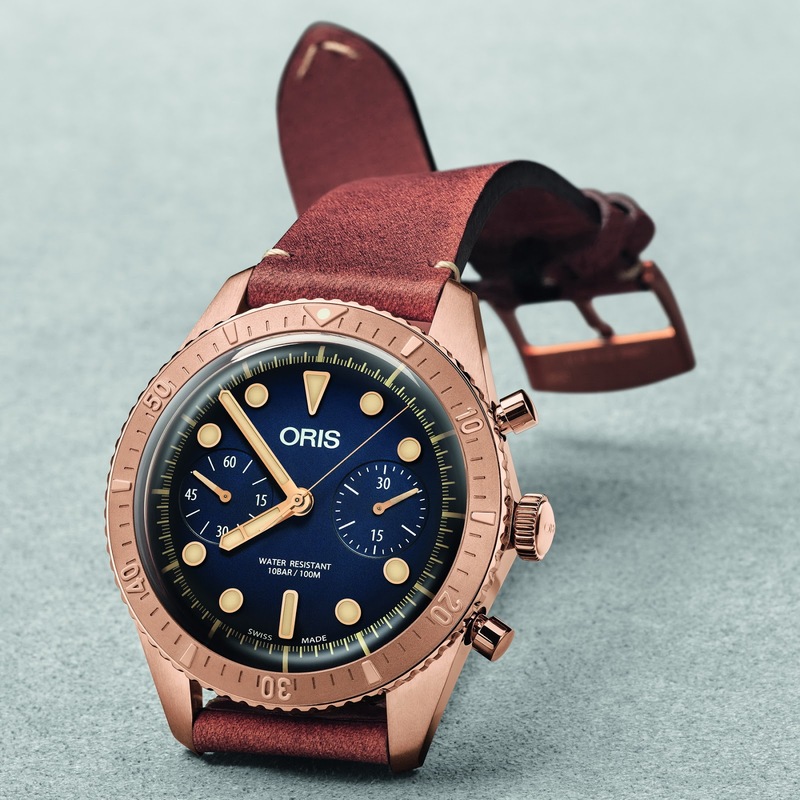 The rule with bronze diver’s is that the case-back should be made from either Steel, Titanium or with have some outer coating, this is because bronze reacts with sweat which not only causes irritation but makes the back go green. The dial’s balanced; symmetrical layout is known as ‘bicompax’ and gives the watch its classic chronograph look, which is further enhanced by the absence of a date indicator. 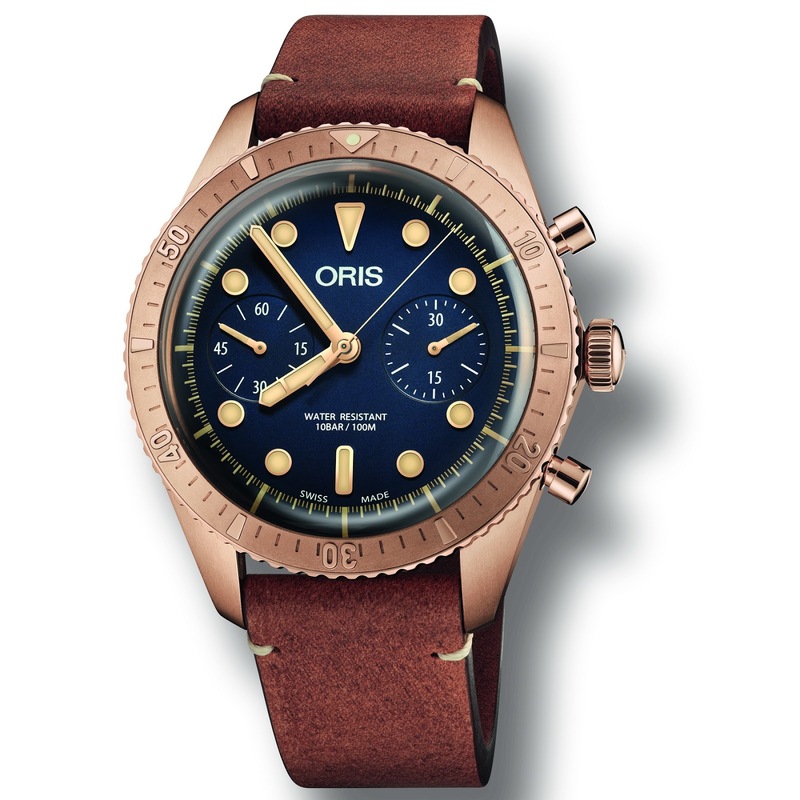 The sub-dial at 3 o’clock is a 30-minute counter; the sub-dial at 9 o’clock a small seconds. The new Carl Brashear Chronograph Limited Edition’s 43mm Bronze case and blue dial has been teamed with a brown vintage leather strap with a Bronze buckle. 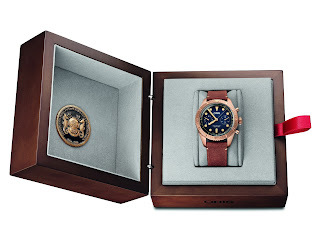 It comes in a special wooden presentation box, complete with a coin issued by the Carl Brashear Foundation. 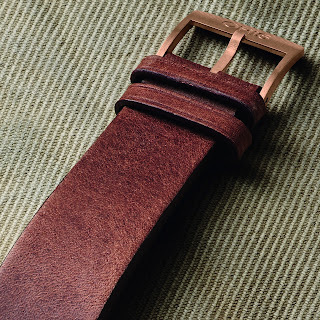 It is a Limited Edition of 2000 pieces. 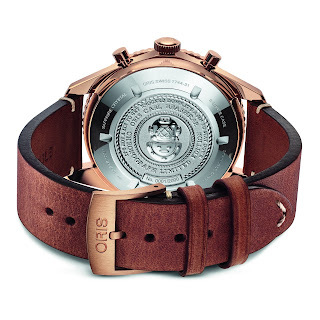 MSRP is 4700CHF.